In Nintendo's Animal Crossing, you're only ever punished for moving too fast. Run around the series' idyllic forest towns and you'll scare off bugs and fish--your primary source of income--crush flowers, and miss out on candid, comical conversations with anthropomorphic critters. But if you take it slow, saunter down those well-known paths and have casual chats with your virtual neighbors, you'll discover rich worlds and a striking amount of depth eked out of colorful vistas and familiar, simplistic systems. I'd be hard pressed to think of a better analogy for the design philosophy that drives Nintendo, a company that's been crafting Fun out of whole cloth for nigh on 125 years. But after an E3 presentation whose reception was... tepid, at best, it would seem that Nintendo's habit of retreading old paths and relying on nostalgia to keep the fans entertained is a failed approach. And yet the fans keep coming, as evinced by retail sales tracker NPD Group's most recent report, courtesy of VG24/7. The Nintendo 3DS was the best-selling gaming platform in May, beating the odds during what was an especially grim month for game sales. The best sellers for Nintendo? 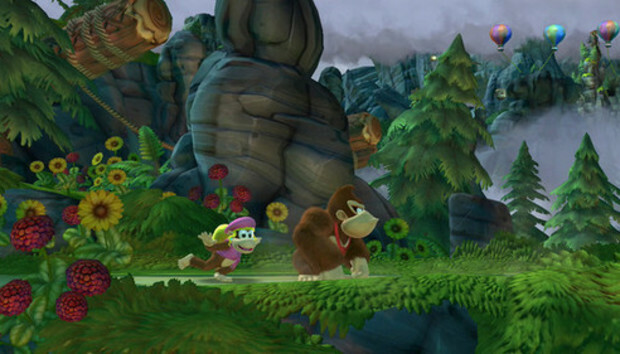 Donkey Kong Country Returns 3D (a remake of a Nintendo Wii game that was itself an homage to the classic Donkey Kong Countries series for the Super Nintendo) and Luigi's Mansion: Dark Moon, a sequel to 2001's critically-acclaimed, best-selling GameCube hit, Luigi's Mansion. As tickled as I was by my phenomenal time with Mario Kart 8 at this year's E3 expo, I worried that the old magic wouldn't be enough for folks who've grown tired of retreading the same old ideas. My colleagues generally agreed, noting that Nintendo's target audience has grown up and younger gamers don't have the same ties to classic franchises. All well and true, but we're missing the forest for the trees: these paths may feel familiar, but with every return to Nintendo's little worlds we're treated with revamped takes on familiar experiences, that breed new adventures to share and stories to tell. It's an approach that's sorely missing in today's gaming industry and our obsession with finding new intellectual properties to explore (and generally burn or eviscerate) before moving on to the next new thing--consider the biggest games of this year's E3, ultra-violent sequels interspersed with ultra-violence in new places. Nintendo's latest console isn't doing so well. Third-party developers aren't keen to get onboard, and it's sad to say that if it is ever pulled out of the doldrums, it'll be on the strength of new entries in classic franchises--the Mario Karts, Pikmins, and Legends of Zelda we're eagerly anticipating in the coming months. As gamers turn to beefier hardware like the PlayStation 4 or abandon consoles entirely in favor of mobile devices, Nintendo's emphasis on tradition and familiarity will eventually see the company ride off into the sunset. It's an inevitable conclusion--assuming they continue to shirk the console hardware arm race, fumble on the basic tenets of internet connectivity in the year 2013, and continue to create befuddling gaming devices that hinder publishers seeking another box to port their games onto. It's sad, really. Animal Crossing: New Leaf is my current little indulgence, keeping me up into the wee hours of the morning with mundane chores (catching beetles to pay off my mortgage) and chats with night owls, and night pigs, and night gorillas. If the Big-N walks the same road as Sega and Atari before it, gamers will lose a lot more than nostalgia. We'll be missing out on a design philosophy predicated on taking things slow, experimenting with old ideas to craft entirely new experiences, and reminding us that there's always something new to discover in the familiar places we've always loved. Nintendo is on the ropes, and its hopes lie in fans who are willing to look past familiar aesthetics to find treasures hidden under the surface. But even if it fails, that legacy is a pretty great one.